Each of Prokaryotics’ antibiotic development programs uniquely target distinct cell surface and fundamentally essential biochemical assembly components of the Gram-negative outer membrane; an intrinsic barrier produced by Gram-negative bacteria which naturally restricts antibiotic entry and ultimate efficacy. 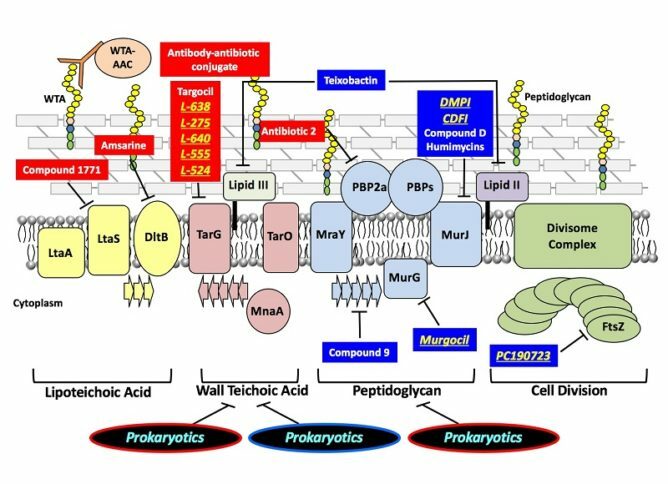 We believe targeting a circuitry of interdependent cellular processes required for outer membrane biogenesis provides a timely and robust opportunity to develop next generation antibiotic agents effective on their own or in combination with existing agents to provide effective monotherapeutic or synergistic efficacy against drug-resistant bacteria. This diagram illustrates select Gram-positive cell-wall associated targets and cognate inhibitors, including Prokaryotics’ agents (black ovals), compounds discovered by Prokaryotics’ founder Terry Roemer (highlighted in yellow, underlined text), and compounds discovered by others (white text). Biologically relevant biosynthetic pathways: lipoteichoic acid (yellow); wall teichoic acid (salmon); peptidoglycan (blue); cell division (green). The potential antimicrobial spectrum for the reported inhibitors is designated: potential broad Gram-positive spectrum (red box/outlined oval); potential broad Gram-positive and Gram-negative spectrum (blue box/outlined oval). This diagram illustrates select Gram-negative OM-associated targets and cognate inhibitors, including Prokaryotics’ agents (black ovals) and compounds discovered by others (white text). 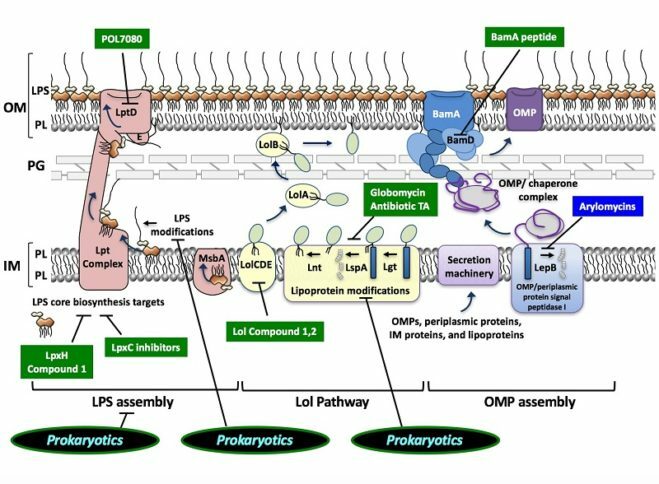 Biologically relevant biosynthetic pathways: lipopolysaccharide transport pathway (salmon), lipoprotein processing and assembly (yellow), and OMP assembly (purple). The potential antimicrobial spectrum for the reported inhibitors is designated: potential broad Gram-negative spectrum (green box/outlined oval); potential broad Gram-positive and Gram-negative spectrum (blue box/outlined oval). OM outer membrane, IM inner membrane, PG peptidoglycan, PL phospholipid, LPS lipopolysaccharide, OMP OM β-barrel protein.